The doors shut and the aggression and anger of the other 300 worried, disgruntled people in the lobby is immediately silenced. It’s quiet until the whir and dull hum of machinery lifts me into the guts of the hotel. When the doors open, I walk into the middle of a dim but contemporary hallway with plush carpet and soft light looking left in silence and right in solitude. It’s eerily dark with no music playing, no sound from the TV or voices behind any of the other doors. I’m on the fourteenth floor but I could be on the 200th for all I know. Coming to my complimentary room, it’s another key card in another lock hearing another beep and click to open the door into another world. Invited in by the natural light of the room from the large window that gifts a nice view of, save for a few small minarets rising from the mosques on the horizon, a pretty indistinguishable but quaint eastern European city. Lounging on the bed I notice the window is a beautiful and dynamic painting of a small city in west Istanbul so I’ll rest and enjoy the art inside the wall. My room is so quiet and warm, cozy and secure. All needs are taken care of and all current urges satisfied. It will be dark by five p.m., as is the modus operandi of a European December so I’ll enjoy what’s left of the daylight in my own corner of the windowsill feeling the cold try to nip at my skin. Slipping on my headphones, selecting a song, gently resting my head back and losing myself to the music gazing out the window. There’s no breathtaking, windswept sparkling ocean view; no world famous, ancient or iconic landmark but I still feel like the king of a one room castle. What else can I ask for? Life is perfect in my own little sanctuary. In this moment, I smile and feel calmly victorious to some beautiful, pulsing trance music. My breath slows for even my heart has to stop to take in the perfection. I’m on another part of the planet, safe and warm watching darkness take the color from the city. Like stars in the night sky, city lights begin to dot the earth. The song I always play in these moments from the window, Marooned by Pink Floyd, begins to fade in to the sounds of seagulls and surf while the room is slowly enveloped by the crawling dusk consuming the final remnants of light. When the drums start to kick in, the room has vanished and I feel as if I’m happily stranded on a dark beach of a deserted island the clouds took the moonlight from or afloat in outer space in a small capsule looking down at the stars. In my mind and life, I sort of am. 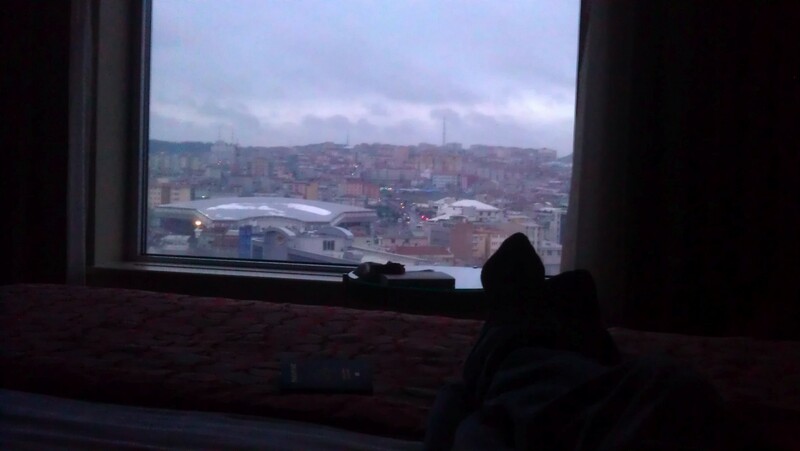 Categories: Window | Tags: Europe, Fun, Istanbul, photography, Solitude, Travel, Turkey | Permalink.